Fatherhood is far from easy, yet the struggles dads face are commonly overlooked. The majority of new parenting advice you come across tends to be primarily focused on new moms, which is great, but what about the dads? Becoming a father, particularly for the first time, can prove to be extremely stressful. Trying to balance your career with your new hectic family life isn’t easy and the financial pressures of providing for the new arrival can quickly become overwhelming. 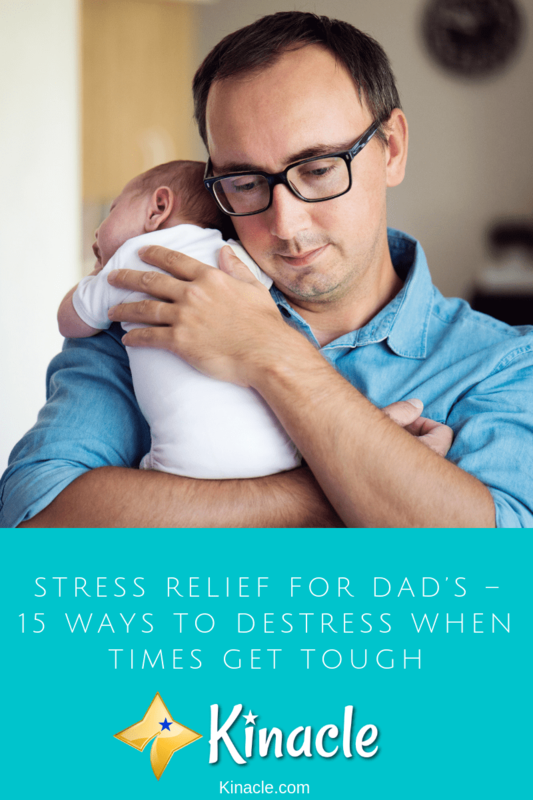 It’s unsurprising therefore, that many dads suffer with stress. The trouble is, stress can lead to a whole host of other issues. It can affect your sleep, cause tension between you and your partner, and if left untreated, potentially even cause resentment for your new family life. However, while eliminating the stress completely may not be an option, there are ways to manage it. Here, you’ll discover 15 ways to destress when times get tough. One of the hardest things many dads struggle with is talking about how they are feeling. They typically feel a lot of pressure to be strong or to “man up” and just get on with it. However, the trouble with this approach is that when you bottle up how you’re feeling, it’s going to come out in unhealthy ways, such as shutting your family out. When you open up and communicate with one another, it can instantly eliminate stress. You don’t need to have it all together, you just need to be honest. There really is no better stress-busting technique than exercise. Helping to release endorphins, the minute you finish exercising, you’ll notice you feel much happier and calmer. It doesn’t matter what type of exercise you do, whether it’s a run, a trip to the gym, or lifting weights at home – any exercise is going to help you to combat stress. You could even get out in the yard or take on a project which requires physical labor. Basically, anything that keeps you active is worth doing. You should also aim to spend some time with your family as soon as you get home. Even if you’ve had a stressful day, diving right into family life when you get back can have awesome stress-busting benefits. So, try not to shut them out and aim to be a better communicator if you want to get those stress levels down. Setting aside a little “daddy time” each day for your kids is really going to help keep you centered. It also provides a great opportunity for you and the kids to bond. You don’t have to dedicate hours of your time, even just half an hour of just you and your kids is going to help. Dads can often feel more distant with their children if they are out at work all day and mom stays at home. So, having that alone time just the two of you can help you to feel just as connected to your children as they are to your partner. Sometimes, it’s important to step back in order to eliminate stress. If you can’t leave work at the office, or if you’re struggling to cope, it’s time to take a breather! This could be anything from five minutes to an hour. When it all gets too much, it really helps to take yourself out of the situation, either out of the house or into another room. Of course, before you do this you should explain to your partner what’s happening. Tell her that removing yourself from the situation temporarily is what you need to get into a better headspace. She’ll totally get it, although she may not be too enthusiastic about you getting a breather if she doesn’t get one! So, make sure you make a pact that you each get a breather whenever you need one, while the other parent steps in. Just because you’re a dad, that doesn’t mean you can no longer have a social life. However, it may look a little different to how it did before! Make the effort to just hang out with the guys. Whether it’s watching a game, playing pool or heading off on a day’s hiking experience – spending time with your friends is going to be a real stress-buster. Again, this will only help to eliminate your stress if your partner also has the chance to get out with the girls when she needs to. After all, you can’t expect her to be cool with you shooting off if she never gets a break herself. If you don’t have an agreement in place where you both get to enjoy time to yourself, you’ll end up more stressed when you get home to your partner! Life can be extremely stressful, so what better way to forget the stress than to make time for family fun? At least one day each week, aim to do something fun together as a family. This could be something as simple as having a movie day or heading off to check out a new attraction. Having fun together will help to build up the family bond and quickly eliminate any stress you might be feeling. This is particularly great idea to do at the weekend. We already mentioned you should hang out with the guys every now and again, but it’s also important to make time for you too. This is more than just a breather. Aim to have one night each week where you can spend time alone, doing whatever it is you want to do. Your partner can also get one night a week to herself, taking it in turns to watch the kids while the other takes some much-needed time out! You’ll be surprised how much more relaxed you’ll start to feel after you’ve spent one night focusing solely on you. Lack of sleep is one of the leading causes of stress, but it is avoidable. While it might be tough during the first few months when baby arrives, it is possible to improve your sleep and cut down your stress levels. The secret is to head to bed early. Sure, you may enjoy the time in the evening when the kids have gone to bed. However, if you’re exhausted and stressed, grabbing an early night can ensure you wake up feeling much more refreshed and relaxed in the morning. It may not sound like a very manly thing to do, but more and more men are starting to realize the benefits of a spa weekend. Even if you can’t do a weekend, heading off on a spa day can still drastically help to improve your stress levels. Try out some treatments, or simply relax in the different spa areas, letting your worries just ease away. You’ll be surprised how different you feel once you walk out of the spa. If you work hard all day, the last thing you probably feel like doing when you get home is cooking! However, don’t see it as a chore, see it as a chance to unwind. Cooking can actually be a very relaxing activity. Many men find it a great way to relax after a hard day. Not only will your stress levels start to dissipate, but you’ll also contribute to providing healthy meals for the family. Oh, and don’t forget the brownie points you’ll get with your partner too! It’s easy to let the romance go when you have kids. However, feeling disconnected from your partner can really contribute to stress. It can also cause you to argue more. So, make time for date nights. If you can get a babysitter, go out for a meal. Or, if you can’t, enjoy a romantic evening at home once the kids have gone to bed. Making time for date nights and making the effort to reconnect will do wonders for your stress levels, and your relationship. If your stress is largely coming from work, it could be worth talking to your employer. As mentioned earlier, a lot of men feel like they have to put a brave face on and take on any work that is given to them. However, if it starts to affect your health and you’re consistently stressed, talking to your employer may be the best step. Let them know you’re struggling and either book some time off or see if you can lighten the workload for a while. Of course, they might not agree, but it’s definitely worth asking. Employer’s are a lot more understanding today than they used to be regarding parental issues. So, it’s always worth seeing what support you can get from work. What you eat can greatly impact how you feel. So, if you’re looking to combat stress, you’ll want to focus on eating clean, whole foods wherever possible. Taking up the cooking tip earlier on the list is a great way to achieve this. Avoid too much caffeine, cut out fast foods and eat nutritious, homecooked meals wherever possible. This alone will hep you to feel a lot better. If none of the above tips help, or if you’re suffering with chronic stress, it’s important to seek help. Go to your doctor and tell them how you’re feeling. The trouble with stress is that if you let it build up and build up, eventually it’s going to really start affecting your health. So, if you can’t control your stress levels alone, talk to your doctor to see what they recommend. Seeking help isn’t weak, it’s actually one of the strongest and smartest things you can do when you’re struggling. So, there you have it – 15 ways dads can combat stress. Did you find any of these helpful? Or maybe you have your own tips other dads may find useful? Share your thoughts in the comments below.